Forestry staff have proposed a scaled down response to the tree disease known as ash dieback in Northern Ireland, in favour of more cost effective measures. Ash dieback is a fungal infection which leads to leaf loss and lesions on the bark of ash trees, and in many cases it will eventually kill infected plants. More than 100,000 of trees have been cut down and about £500,000 has been spent in a bid to contain the disease. But it is still spreading and staff say that approach is no longer practicable. Stormont's Department of Agriculture, Environment and Rural Affairs (DAERA) has launched a public consultation on proposals to change their approach to tackling the disease. It suggests that when plants are found to have been affected by ash dieback, DAERA would no longer issue "statutory notices" saying they must be destroyed. The consultation also proposes that the "emphasis on finding and reporting disease on a statutory basis should change to a voluntary one". Landowners who discover ash dieback on their property are invited to report the issue and would still be given official advice on how to manage infected plants. The consultation also suggests volunteers could help to monitor the disease and "gather evidence about the natural resistance of native trees". 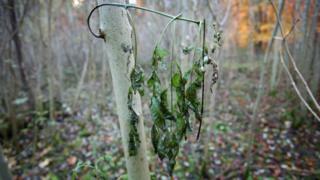 Ash dieback was first identified in Poland in 1992 and has spread through much of Europe. The first case in Northern Ireland was reporting in 2012, when the disease spread through a shipment of infected saplings. The following year, an all-Ireland strategy was launched in an attempt to eradicate the infection. Until now, DAERA's Forest Service has invested its resources in searching for infected trees and destroying them, but it no longer considers that to be a cost-effective option. "Nevertheless, the evidence now points to the fact that the disease is still spreading. In light of this, and scientific research, we do not believe that we can justify continuing that approach." Ash is one of the most common trees in Northern Ireland and ash dieback has since been identified in native ash trees and hedgerows. Last year, scientists in England identified an ash tree that showed a tolerance to the disease. Nicknamed Betty, it raised the possibility of selective breeding to develop trees that are resistant. DAERA's consultation document states: "Our view is that the disease will continue to spread through the native ash population, just as it has done in GB and continental Europe. "Over time increasing numbers of native trees will display crown dieback symptoms, but some individual trees may survive because they have inherited resistance to the disease or the growing conditions will inhibit infection." The consultation will close on 5 February.